The following image and the accompanying text present the papacy as a diabolical institution. The woodcut shows a cross bearing the instruments of Christ’s passion and crucifixion. Attached to it is a certificate of indulgence bearing the legend, “A Sack Full of Indulgences for Cash.” Below are flags showing the papal arms. Between them is the seven-headed papacy, a diabolical monster made up of the pope, cardinals, bishops, and monks. The monster sits on top of an indulgence chest in what is identified as the kingdom of the Devil, who lies beneath it. 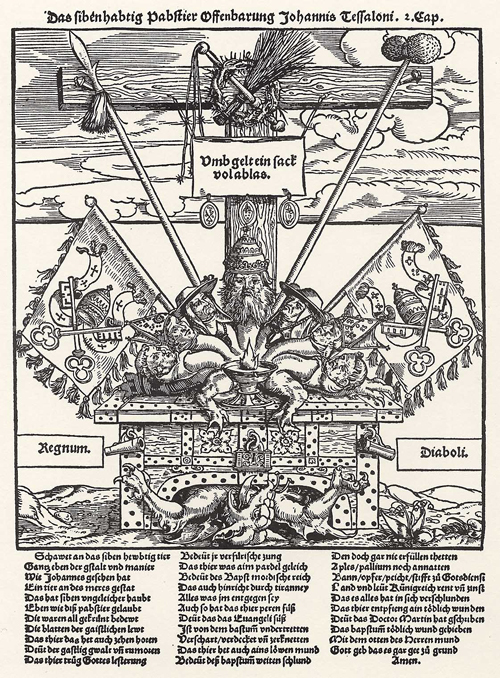 The woodcut is a response to “The Seven-Headed Luther.” Woodcut by unknown German artist, c. 1530.